So today, Tuesdays, I am usually at a church study, but this term it is 9.30am-12noon, which is a long time with a kid. I have to leave at 9am and don't get home til 12.30pm. It makes the whole day a pain, especially when baby sleeps 9.30-10 and then from 12noon-2. It just stuffs his whole day up and I end up stressing about how my Tuesday afternoon is going to go. So I have given it up today for the rest of the term. Which left me free this morning. 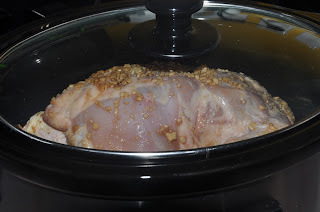 I put the slow cooker on with a chicken for dinner, technically I have been cooking dinner all day long. It smells so yummy thru the kitchen/dining area. And I was able to make some pear & banana muffins for baby too. I should also mention that today I gave up Farmville & Social City on Facebook. I feel so much better for it, it's great not being tied down to it and having to 'harvest' things before they expire. It's like a weight has lifted. It will be interesting to see if I can stay away from them. Instead of farming I got to play Wii Fit while baby slept, I did 44mins of yoga, balance and aerobic activities! And then I topped it off this afternoon with a walk to the chemist & Foodtown in my new pram. Go the Wii Fit! Much better than Farmville :) I gave up FB games a while ago but am back at them grrr.